Plot: Product Description: Sir Thomas More, wit, politician, martyr, and man of conscience. Refusing to go against his own beliefs by signing an oath declaring Henry VIII, Supreme Head of the Church of England, More is a tragic hero with all-too-human attributes. Here is another fantastic choice to display on a worthy Blu-ray. A fantastic biography drama that stands the test of time as being an important piece of film making. A wonderful cast alongside amazing directing, sets, costumes and a tight story unfolding on screen. Dramatic history at its finest. An all-star cast and a rich direction give this movie a lasting impression. I first saw this when I was a child, and this is only my second time seeing it. It was a fantastic revisit to this important piece of cinema. What better way to see it then on a top notch high quality blu-ray. Twilight Time did a lovely job as always, giving a new outlet to a forgotten piece of brilliant cinema. All one has to do is look at the phenomenal cast of actors and actress’ in this historical, dramatic piece of cinema. The amazing one of a kind, who needs no introduction or write up, the one and only Orson Welles. The two very gifted and beautiful ladies, Wendy Hiller and Susannah York. The extraordinary Robert Shaw. The ever masterly actor Nigel Davenport, Leo Mckern and the truly wonderful John Hurt. But the man that owns and displays the most important character, is the spectacular Paul Scofield, as Thomas Moore. What I find interesting, and somewhat heartbreaking, is that he only acted in a little over 40 performances. His excellence in performing is beyond words. It surprises me he did not act in a lot of film. Paul Scofield was a dynamic performer that created so many lasting characters. He gave the total control of a performance. He was and is the very pivotal reality of what performing, as an actor/actress is about. He was a sophisticated actor. A true stage performer. A man who was able to bring the characters to life in breathable reality and not just seem like it was fiction being filmed. The character of Thomas Moore in The Man for all Seasons displays that truth. Scofield gives his all to the part, and is one of the greatest performances of all time. Equally impressive is the man behind the camera calling the direction. Fred Zinnemann needs no introduction, but because of this modern generation who many persons calling themselves movie buff’s, don’t look to the past of cinema, I have to describe a man that should be on any movie buff’s mind. Zinnemann was a director, producer that gave the world masterpieces. Yes masterpieces. The one and only western masterpiece, 1952’s High Noon. If that doesn’t tell you anything nothing will. He also brought the masterpiece, 1953’s From Here to Eternity, 1948’s The Search, the amazing 1973's The Day of the Jackel, and 1977’s Julia, which I highly recommend watching just like all the others I have mentioned, and many, many others. Now his, From Here to Eternity, and also the one I am reviewing, A Man for All Seasons, both won him, Best Feature Film at the Academy Awards in 1953 and 1966. That shows you his amazing talent, and plus I have to mention that in his vast career of directing, he has directed 18 actors to be nominated for Best Actor by the Academy Awards, and 6 of those actors won for best actor in his films, which is a stunning realization of his brilliance in directing performers. One of those six best actor awards was for Paul Scofield, acting as Thomas Moore in A Man for all Seasons. A Man for all Seasons won big at the Academy Awards, not only Best Actor, but, Best Cinematography, Best Costume Design, Best Director, and Best Picture, so it shocks me that this film has never been given the grand treatment it deserves, and so that is way Twilight Time did the amazing job of crafting this masterpiece on a new outlet. Now the movie is based on the play by Ricard Bolt. Also on an interesting note this was made into a 1988 TV movie by the same name, and surprisingly, it also is a really a good film starring some amazing actors like Charlton Heston who plays Thomas Moore. Heston also directed it. In the TV version the beautiful, talented and utterly brilliant actress Vanessa Redgrave plays the part of Lady Alice. If you watch the original film version I am reviewing, you will notice Vanessa Redgrave is also in it, in the character of Anne Boleyn. Vanessa Redgrave’s brother is Corin Redgrave who always plays in the 1966 version as the character of Roper. Also this film was a huge hit, the cost to make was only 2 million, but it’s box office won it over 28 million in sales, which was a massive hit for its time. What makes this film stand out is not only the acting, or direction, but it’s the flawless costumes and cinematography. These two realities of this film, both awarded with accolades through award shows. These two realities stood out during the time of this film, and still to this day, it’s one of those movies that showcases these art-forms. The costumes and cinematography in this film created by the behind scenes work, showcases how important these two jobs are to help make a memorable film. Two of the most important concepts of film is costumes and cinematography. I think that is one reason, I love a lot of the choices Twilight Time makes in picking the films they bring out on Blu-ray. They choose a lot of films with extraordinary behind the scenes workings, such as cinematography, soundtrack, and direction. 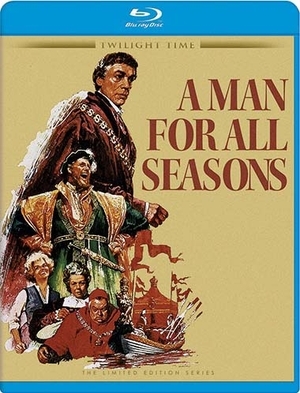 A Man for all Seasons is one of those great choices. Never has this looked or sounded any better. It’s a piece of ear candy and visual beauty. Loved this HD. Vibrant, crisp in image and sound. This is only the 2nd time I have seen this picture, and it looks amazing considering how old this film is. Isolated music track. Composing the music for the film is another worthy to be talked about persona in the film world, Georges Delerue. He died young at the age of 67, but left a vast array of excellence to be remembered in the film world. He had an amazing total of well over 350 composing jobs. From such greats like, 1959’s Hiroshima Mon Amour, 1963’s Contempt, 1970’s The Conformist, the amazing 1983’s Silkwood, that I wish someone would honor and bring out on Blu-ray. 1986’s Platoon, 1989’s Steel Magnolias and many, many more from Composing, to musical director, to conductor. He was an amazing musician, and he shines on this isolated music track. Another fantastic special feature. Audio Commentary with film historians Julie Kirgo, Lem Dobbs and Nick Redman. A priceless example of how to create a listenable expertise in cinema. Loved this commentary. I enjoy listening to personas who have a passion with cinema and all three of these clearly understand, respect, and know the art-form of cinema. Highly praised by me for this commentary. Loved it. A program of the Life of Saint Thomas Moore. A little over 18 minute program about Thomas Moore’s impact on history. And as always the very important booklet insert by film guru Julie Kirgo. Priceless as always. A must own Blu-ray of high quality beauty. A movie that stands the test of time through acting, direction, and everything that went into creating it, from costumes, to music, to cinematography. This film, and this Blu-ray is flawless, loved this release.